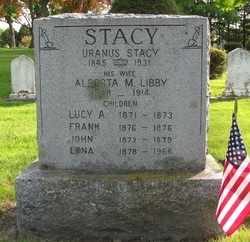 URANUS STACY, the son of Shadrach and Urania (Huff) Stacy, was born 9 Sep 1845 in Saco, Maine [ME death rec]. He died on 23 Oct 1931 [ME Death Rec], and was buried in Laurel Hill Cemetery, Saco [YCCI, p1604]. He married on 13 May 1869 in Cape Elizabeth [ME Marr Rec] to ALBERTA M LIBBY. She was born in Portland about Dec 1848 [ME death rec; 1900 census] and died on 21 Aug 1914 [ME death rec], the daughter of William and Hannah (Storer) Libby. She is buried with husband in Laurel Hill. Following his service with the 27th Maine, he reenlisted with Co E, 29th Maine Infantry, and served with them from 13 Nov 1863 to 21 Jun 1866. His brother Owen Stacy served in the 17th Maine 1862-1865. Uranus was a blacksmith and carriage smith in Saco, living on Green St.
V. EDNA STACY, born May 1878 [1900 census]. She died in 1968, and is buried with parents. She never married, and worked making buttons in the cotton mill.